Double your visibility with the Danger Zone. PDW's compact Tail Light uses two blinding 1/2 watt LEDs which demand to be seen after dark. 50 hour burn and three running modes. Included bracket easily mounts to your seatpost, rack or seatstays or pretty much anywhere else thanks to a built in belt clip. Includes two AAA batteries. 50 hour run time. I run this Day and Night for full rear Visibility. Two bulb Random flash gets attention. This is battery model, I have 4 USB charging lights, so this good. I ran about 3 weeks before needing to change battery. The only way this light could be improved upon is to have it rechargable. We use them for visibility during the day and they can be seen for at least 1.2 mile. We agree, so we use rechargeable AAA batteries with ours. On long trips, we carry charged spare batteries and swap them out when the light gets too dim. I bought lights for us to use during day rides, as here in So. Cal more people are doing this and anything to improve visibility is a plus. The underover light pattern seems to work really well and in my view the most effective for visibility. I just wish that it was rechargeable. Move over Planet Bike, the Portland Design Works Danger Zone Rear Light is Bright and also an ATTENTION Getting light. In all fairness the PDW handle bar mount is much better, easy to set and does not slip from the setting mount and the side to side direction can be slightly offset. To be seen at night I use both the PlanetBike Turbo and PDW Danger Zone Rear Light. TO Be really seen I also mount on each side of the top bar the PDW so that I can be seen from the side (have it tilted up and ever so slightly back) so as not to get in trouble with the cops. Cars can see me as I come up to intersections. I would like to see a larger mount to fit on the thicker top bar on Mt bikes. I bike about 60-100 miles a week, and now have this light on 3 of my 4 bikes. Super bright, good options for flash, good battery life, totally waterproof. Especially like the new strap attachment for quick release, but just need to remember to take it with me, so some MF doesn't walk off with it. Best rear light I've had yet! The blinking is not blinding to others in my group ride, as we cycled from Phx to Globe, Az earlier this month. Easy to operate and solid construction....didn't pop off of rear saddle, even with lots of bumps in the road. Long battery life as well and easy to be seen even during mid-day rides! This rear light does the trick. It has three different blinky settings and one of them really gets the attention you want in dangerous area. Very bright light that can be seen from a long distance. The price is very good compared to other lights. Delighted to support the local economy, and, delighted this product works so well. 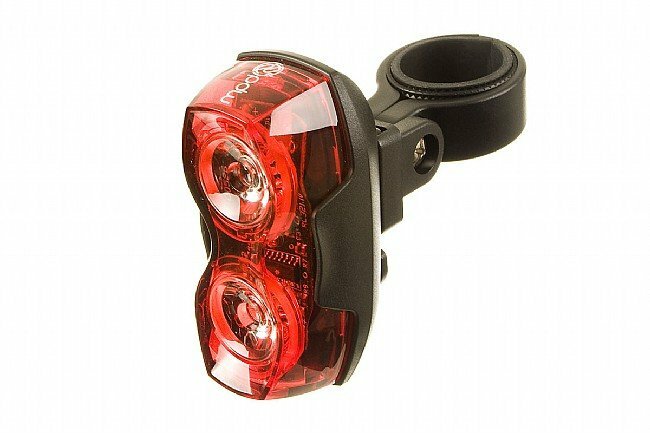 I use this tail light because it's especially good for group road rides. Personally, I'm just the right height to be blasted by those other too rapidly flashing and unnecessarily, painfully bright tail lights. Portland Design Works Danger Zone Rear Light is fellow cyclist friendly and motorist friendly too in that it's bright enough to be seen, flashes enough to get you noticed but not so fast that others, including drivers are uncomfortable or upset with you. I've had this light for months now. Very dependable and so bright. Love the different flash patterns. I always ride in the rear of the group because my lights are the brightest. This is the brightest rear blinkie I have ever seen and the multiple flash modes are great. I have no fewer than 5 rear red flashing lights on my bike and jacket as I commute through the dark wet winter here in the PNW. This one wins the visility contest hands down. Best Light For The Money... Simple as that! For $30 you cannot go wrong. The blink pattern is amazing. It's completely dynamic directing more attention to the cyclist's presence. I use mine for winter club rides starting after dark and I absolutely love it. Note that it will not fit on tri-style seat-posts without an alternate adapter. But this light, you will not regret it. Use it while night riding. Fantastic attention grabbing flash pattern and a very, very bright light. The two separated LEDs add a perception of movement in the flash mode that further enhances its ability to grab the attention of motorists. I use it in daylight to make sure I am seen in traffic and seems to work very well. Have not had to change the battery yet which others have found very difficult and can't attest to its ability to keep working in the wet. Great light, short battery life. This has been a great light in terms of durability and brightness. I have dropped in a few times, ride over rough terrain daily, and have taken it through many a rain storm. It plenty bright and easier to locate in the dark by motorists then a nonstop disco party light like the PB blinky, though I have one of them and use it sometimes. It's biggest draw back is the battery life, when used in the slow blinking mode, the batteries don't last long. Though that is to be expected, it's practically 'burning' all the time, rather then small bursts of power. I use only rechargeable batteries, so I just carry spares, though I may have to go with a Lithium powered rear light in the future. I'm always interested in better lighting for my commuting and club rides. This light is as bright as any ive tried but the pattern is superior. Studies have shown that drivers actually steer toward flashing lights. The alternating dimbright pattern is superior for avoidance. That's why it's used for aircraft. Mounting is very simple. I use it even in daylight. As I transition from sunshine to tree shadows, it gives me a comfortable edge. I've actually noticed the red glow on the pavement while in the shadows.